What Is the Answer to Zeno’s Paradox? (2014), by Brian Palmer. Before tackling Achilles, it will help quickly to reconsider our pie. Imagine a man adding all the slices together, starting with the largest one, in an effort to recover the whole pie. As before, he lays down the first slice in ½ a second, the second in a ¼, and so on, at an ever increasing speed. No one can actually do this, of course, since one’s hand can only move so fast, and no pie can be infinitely sliced anyway. But we can simply imagine it, and suppose even that the man succeeds. 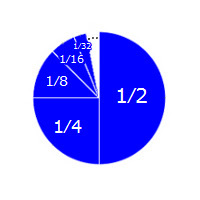 At exactly one second, no slice is unlaid, and the pie stands there complete. The unexpected question we need to consider is this – where is the man’s hand? Prior to one second, his hand was shuttling endlessly between the pie and the unlaid slices. But where is it at exactly one second, when the pie is complete? As with Thomson’s lamp, no answer is forced upon us. Nothing dictates where the hand must be, so it can be anywhere at all. But, equally, no matter where it is, it will be disjoint from all its prior states. This is a real pickle, since, so far as we know, one’s hand cannot be disjoint from its prior states like that! Thus, suppose that the hand is beside the pie at exactly one second, as though the man had just laid down a slice. That’s where you’d think it would be, but why? How did the hand get there? The familiar answer, “The man moved it there,” is not available. (He certainly didn’t move it there in the act of laying down the last slice!) Indeed, no explanation is possible. The hand is just there. So his hand was oscillating ever faster between the pie and the unlaid slices, and then it is at the pie. Or wherever else. The hand could even be on the moon and it would make no difference. In every case, there is no explaining how the hand got there. To be clear, this problem does not affect the pie itself, whose transition to completeness is perfectly smooth, with no disjoint appearing at all. The difficulty only arises for the man’s hand. Thankfully, however, this difficulty is not pressing, since no pie can really be sliced into infinitely many pieces and then recovered by laying down the slices at ever faster rates. So it doesn’t matter if this unreal feat engenders the correspondingly surreal consequence of a man’s hand being disjoint from all its prior states. In contrast, it should bother us if such a bodily disjoint could be shown to accompany a mundane event like a man walking through a doorway! This may be the exact thing that was bothering our antagonist. There Achilles is, navigating Zeno’s endless sequence, and then, suddenly, he is at the doorway. The transition seems as extraordinary as the man’s hand appearing suddenly beside the pie. So our final question is whether Achilles may fairly be compared with the man and the pie. Does a bodily disjoint arise in the same way for Achilles? If so, that would be truly extraordinary, and our antagonist may rightly claim to be victorious.